Onto another Scottish Isle: Jura, Islay's northern neighbor. The single distillery on Jura opened for production back in 1810. After passing through at least four separate owners, it was then closed and dismantled in 1901. Fifty-nine years later, Charles Mackinlay & Co rebuilt and expanded the distillery, then restarted production by 1963. Through another handful of corporate buyouts and restructuring, the distillery came under the ownership of United Spirits (the largest alcoholic beverage company in India) in 2007. There has been a real dearth of United Spirits whiskys on this blog for a mix of reasons. Their Whyte & Mackay blend has yet to make to the US even after so many years. Dalmore's zany pricing and agressive push into the ultra-luxury market leaves a worse aftertaste than does their current 12yr single malt. It's difficult to find much Fettercairn in The States and no one yet has convinced me to shed my cash for even a sample of it. And then there's Jura, a dram that's usually just okay. I used to like their 10 year quite a bit, but my two most recent attempts at it brought me back to that "just okay" response. I wanted to give one of their more interesting bottlings a chance here before much more time passes. Why worry about time? Well, guess who now holds the largest ownership in United Spirits? Diageo. But let's not let Diageo piddle on this parade yet. Richard Paterson (Whyte & Mackay Master Blender and genuine whisky celeb) and his Jura team start with a dose of Jura's peated malt (which also makes up their Prophecy bottling) then add various older casks. The peated (at a healthy 55ppm, though this amount is disputed) malt is likely young since no age is provided, though Jura is happy to let us know that it makes up 13% of the final Superstition product. Superstitious! Meanwhile the older whiskys are between 13 and 21 years old. Superstitious! And Blackjack! I jest in jest. What it actually is is a lightly peated NAS whisky chillfiltered, colored, and bottled at 43%. But as part of modern whisky marketing, it is given a character and a story. 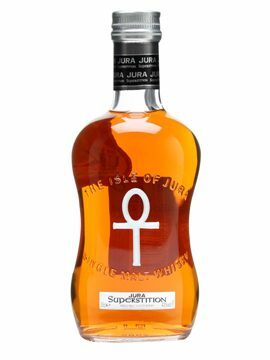 And though that story references the superstitious nature of the Jura people, the Egyptian key of life is emblazoned on the front of the whisky bottle. But is the whisky any good? Nose -- It's at its best towards the beginning of the glass: Cherry liqueur, cantaloupe, and veggie peat. With time the veg note gets a bit astringent. Not gassy, but quite sharp. There's some milky coffee, dry sherry, and cranberries mixed in. At its worst: chlorine meets pencil lead and sour milk. Time does it no favors. Palate -- More smoke than peat. Butter and notebook paper, a little earthy. It gets MUCH sweeter with time in the glass. It reminds me of a blend but with more hoppy bitterness and malt sugar. Seems very young. Finish -- Vanilla smoke with bitter burnt coffee grounds. Lightly sour, but very sweet. That bitter note grows and grows. The smoke lingers along with some cayenne pepper. I'll lead with a positive thought. I'm actually curious to try their straight-up peated whisky, Prophecy. Its phenolic content measures higher than that of Ardbeg, Longrow, Lagavulin, and Laphroaig's regular whiskys. But about this Superstition... I'm not sure where those older casks are hiding because this tastes like a young blend. Not a bad blend. But when I tried it side-by-side with the five-year-old Bank Note (an actual blend, btw), the Note felt both fuller and subtler with better oak interaction. And maltier too for that matter, but that could just be my tastebuds' interpretation. The nose is like Ebby Calvin LaLoosh, sorta all over the place. The finish has many of the elements that should appeal -- vanilla, earthiness, pepper -- but it just sweets-up and bitters-out big time. Even the reddish color seems odd coming from ex-Bourbon casks. Well, not that odd if the color is getting a chemical boost. Wow, this turned out to be a much longer report than I'd thought, as my tasting notes were very brief on this one. I'll depart by encouraging the curious to seek out a 50mL mini of Superstition rather than going in on a whole bottle blind. Perhaps you'll discover the positive side as Ian Buxton has or maybe you'll side more with Andy Smith. I'm with Andy on this one. Last I checked, Prophecy was listed at 37ppm. Ardbeg, Longrow, and Kilchoman are listed at 55ppm, Laphroig at 40ppm, and Lagavulin at 35ppm. It still makes my top ten of affordable peated whiskies though. Hey Mantisking, do you know where that 37ppm listing is from? Connosr says 60ppm, Whiskyscores says 37ppm, and I found the 55ppm in this year's Malt Whisky Yearbook. Someone knows the truth! Michael, that was from Dave's review. He actually says "up to 60 ppm", which doesn't actually help us much. Here's one that claims Prophecy is 37 PPM. As the "heavily peated Jura", that might be expected as the top end of their peating levels. Basically it sounds like no one has a clue. Someone from the distributor, or the distillery, or United Spirits is dishing out conflicting info. Or it's been changing from year to year. Or we're guessing. We bloggers need to be better about siting our sources. The Norwegian site seems to have got its info from Paterson himself. Scotch Odyssey appears to have gotten his info from the distillery. I pulled my info from Malt Whisky Yearbook. Luckily those fall in the 50-60pppm range. I recently spotted a nice Jura miniature collection of the 10 year old, Superstition, and 16 year old for $11.99. Since my only other exposure to Jura was a real nice 12 year old rum finish from indy Chieftan's, I figured why not. Yep, Hi Time used to have that collection too. A great way to try out those Juras without springing for whole bottles. I wish more companies released minis in the US! We were lucky enough to be invited to an evening billed as "a culinary adventure to the remote Scottish island of Jura, with each dish inspired by the natural larder of the island and paired with selected sweet and smoky drams from the Jura distillery." Suffice to say it was amazing! Looks like you folks had a lot of fun. The Jura Prophecy must have been great with the clafoutis and ice cream!